*Blastaar: Blastaar is an alien who lives in the negative zone. Blastaar used to be a king of his race called the Baluurians, but when he was overthrown he became an intergalactic outlaw. 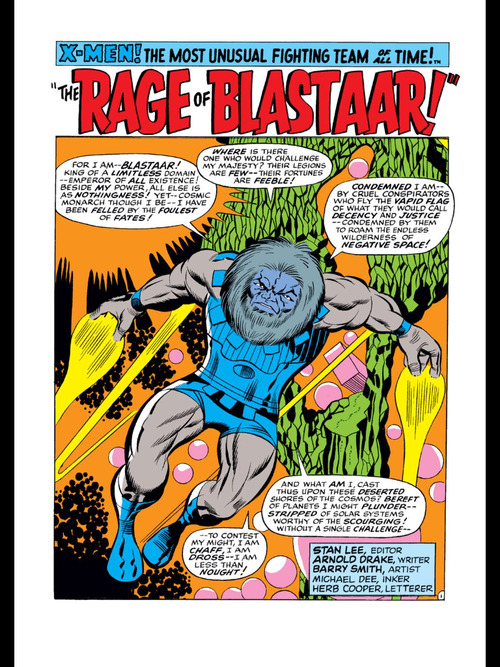 Blastaar first made it to Earth when he followed Reed Richards there and he has been going back and forth between Earth and the negative zone ever since. -Powers: Blastaar has superhuman strength, endurance, and durability. His body can withstand missiles and extreme variations in temperature and pressure. He is also tireless and can live without food or water indefinitely by inducing himself into a state of hibernation. His final power is that he is able to blast concussive energy beams out of his hands. 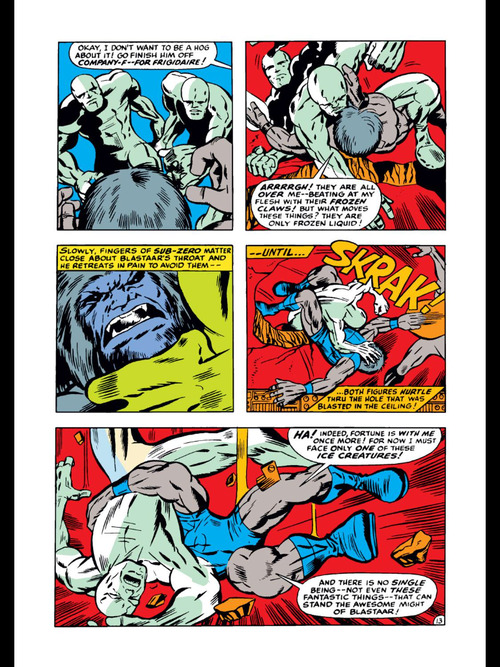 This issue begins with Blastaar floating around in the Negative Zone and angrily wishing he could escape. Then we see Jean Grey working with adevice that Professor X created that allows Jean Grey that allows her to transmute her matter into radio energy and send that energy into space. While using the machine, Jean gets wounded and the device breaks. Then suddenly Blastaar appears out of thin air, summoned by the device. Blastaar and the X-Men fight until Jean is able to send the villain back to the negative zone by electrocuting him. The issue then shifts to the conclusion of Beast’s origin story. At this point in the story, Beast has stolen a device that could give Conquistador the power of the sun and he is now the villain’s prisoner. Shortly after the story begins, Beast escapes his restraints and tries to battle Conquistador, but he is losing. 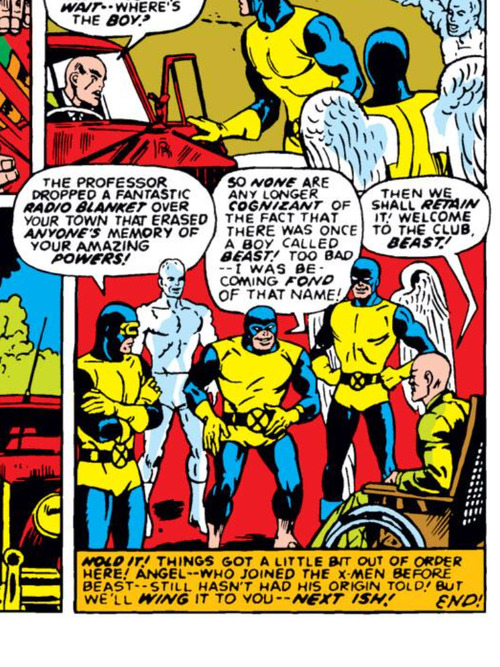 Thankfully for Beast, the X-men enter the baseand save him from his captor. After the X-Men defeat Conquistador, the villain’s base blows up and Professor X makes Beast a member of the X-Men. This issue was not as good as the recent Polaris saga, but it was still an ok issue. Although the way that Blastaar came and went was pretty ridiculous, I enjoyed him as a villain. He seemed tough and his power set lent itself well to a fight with the X-Men. Let’s talk about how Blastaar came and left the issue though. That device that Jean used to summon the villain is absolutely absurd and not plausible in any way. I have no idea what it was supposed to do. Also, how does electricity send Blastaar back to the negative zone? 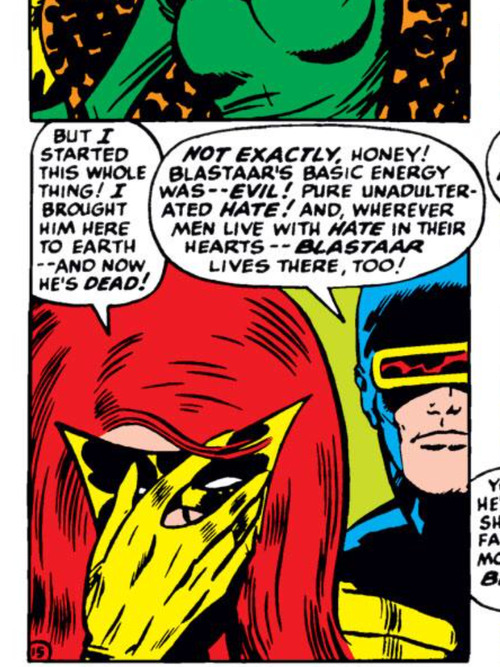 And why is Jean so sure that Blastaar is dead? He is definitely not dead. A villain of Blastaar’s caliber should have been treated better by Drake. My final problem with this issue was that I wanted more Polaris! Where did she go? I thought she would join the team for a little while after the X-Men saved her. I hope she returns soon. Beast’s origin story ended pretty predictably, but it was still a good ending. Beast was finally able to rebel against Conquistador and the X-Men finally found Hank and were able to help him. Hopefully Angel’s origin story in the next issue is as good as Beast’s origin story. Overall, this issue had some major flaws, but I still enjoyed it. 1. 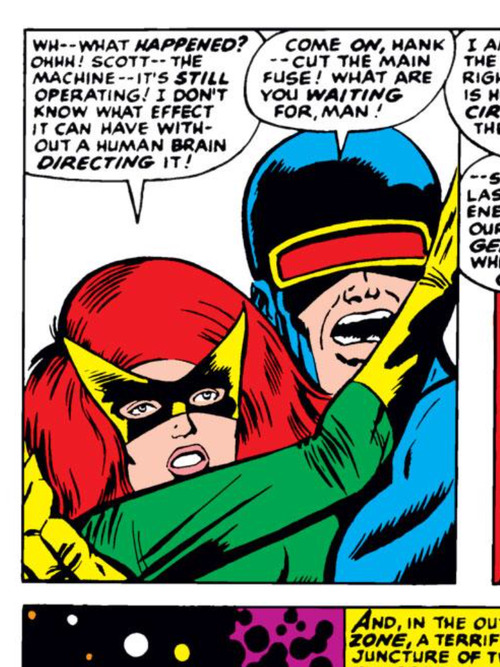 I enjoyed this panel of Cyclops holding Jean when she is wounded. 2. 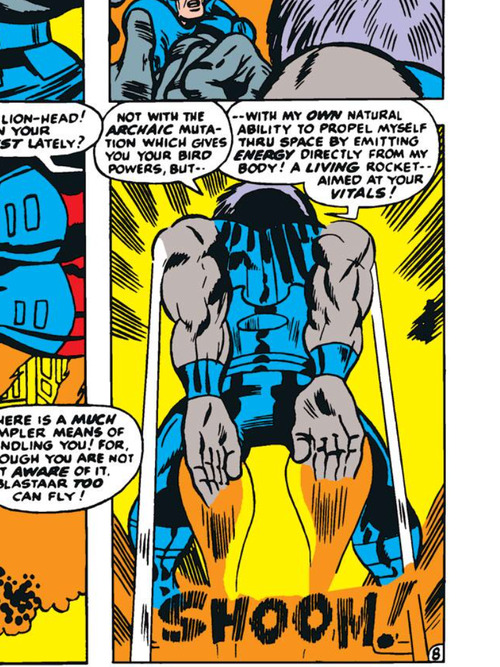 Blastaar can use his energy beams to fly! 3. 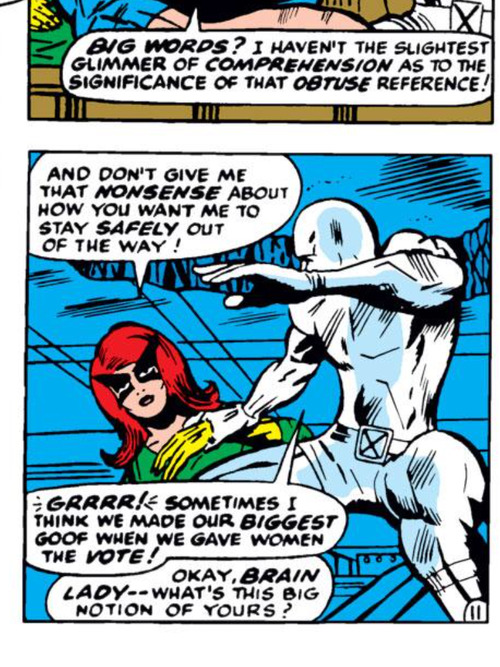 Wow Iceman, that is a super sexist remark. 4. Somehow Iceman was able to create full ice people that Jean Grey could make fight with her telekinetic powers. Seems a bit implausible to me. This is such a stupid issue. 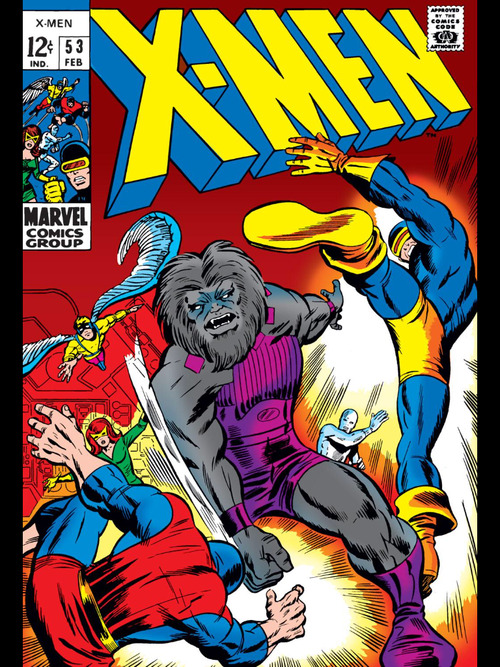 The best part is the cover, where Blastaar pimp-slaps Scott. Look at his left hand: That’s a pimp-slap. The bit with the ice mannequins was silly. Blastaar was always a boring villain. Angel was characteristically useless. Iceman’s a misogynist. Bleh. Bad issue. As for the back-up: Xavier wipes the memories of the whole town. But Beast was seen on national TV. Also, last issue, Beast stole a nuclear generator, but now it’s a solar generator. Also, Xavier uses his telekinetic powers to manipulate the circuits of the Conquistador’s doomsday device – since when does Xavier have telekinetic powers? Yeah this issue wasn’t the best, but I didn’t hate it as much as you did. I’ve definitely read worse issue. Although all of your points about the contradictions in this issue are very true. Hopefully issue 54 is better. I’m puzzled about the mindwipe. My vague memory was that the town was already aware of Hank’s unusual abilities and kind of okay with it. Was I wrong? Yeah that is true. The townspeople seemed to be ok with Beast’s powers, but that may be because they think he is just a super athletic “normal” human. You are definitely not wrong about that contradiction. Using force beams to fly! I suppose Cyclops has tried that and it doesn’t work for him? What is it about the Negative Zone that makes the people there megalomaniac dictators? Blastaar and Annihilus seem to have almost the same personality!